Holiday in a unique rustic and stone building with a provence / mediterranean atmosphere. A stunning Bed & Breakfast Accommodation located on the beautiful Shoalwater Bay Marine Park overlooking Seal & Penguin Islands in the Rockingham area, only 45 minutes from Perth. We are also only 2 minutes from HMAS Stirling, and 10 minutes from the Kwinana Industrial Strip. This is an ideal stop on the way to Margaret River. Ideal for Holidays Maker, Wedding Nights, Honeymoons, Weekend Getaways and Romantic Retreats. We also welcome Corporate Bookings. Feel, smell and view the Indian Ocean from your room whilst having access to some the most natural eco sea-life in the world. Please Note - Manuel Towers is a Non-Smoking establishment. NO SMOKING in rooms, on Balconies or in Courtyards. Smoking is ONLY permitted 5 meters away from the outside walls. 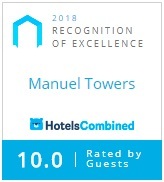 Manual Towers is also a ‘Healthy Hotel’ via the Healthy Hotels Program - were all our rooms and bedding including mattresses are sanitized for your health and comfort. Rockingham is a world class eco environment and has many world class tours and activities. If you book one of these tours, Manuel Towers will offer you $25.00 off the price of a room or one of our units (minimum of two nights for units).